Immediate Occupancy !! Over 90% sold!15 Year Tax Abatement!! 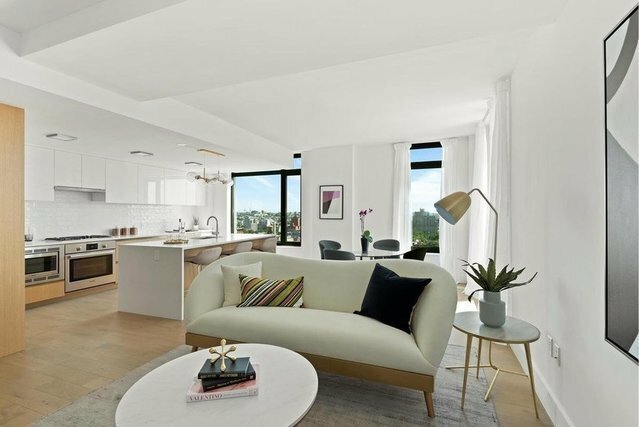 Residence 16A is a beautiful 3-bedroom, 2.5-bathroom unit with an open, airy layout accompanied with oversized windows that allow for an abundance of light and spectacular views. In addition, the generously proportioned living/dining area features an expansive terrace right off the living space while the three bedrooms are located separately in the western portion of unit. This one-of-a-kind layout is complete with beautiful oversized windows, 6-inch-wide plank oak floors, Bosch washer/dryer, and an efficient central A/C and heating system.An open floor plan showcases a contemporary kitchen featuring top-of-the-line appliances including Canadian white oak veneer lower cabinets, white lacquered upper cabinets, Caeserstone Frosty Carrina quartz countertops, Grohe faucet, and Bosch appliances.The master bedroom suite contains a walk-in closet with a surplus of space. The luxurious master bathroom features sleek modern finishes that are in sync with the feel of rest of the apartment. All of this is nicely accented with a stall shower, providing a one-of-a-kind sanctuary that is complimented by a walnut veneer double vanity and pure white Caesarstone quartz countertops.The Nevins is a Luxury Condominium offering 24- hour Doorman and Concierge Services, Package Room, State of the Art Fitness Center, Residents Lounge Designated for Entertaining, Kid's Playroom, Bicycle storage and Private storage, Rear Outdoor Courtyard with Lounge Seating, and Landscaped Roof Terrace with Panoramic views. It is ideally located at 319 Schermerhorn, in the heart of Boerum Hill, where classic Brooklyn neighborhood-charm meets modern urbanity. The complete offering terms are in an offering plan available from the sponsor, file number CD 15-029.